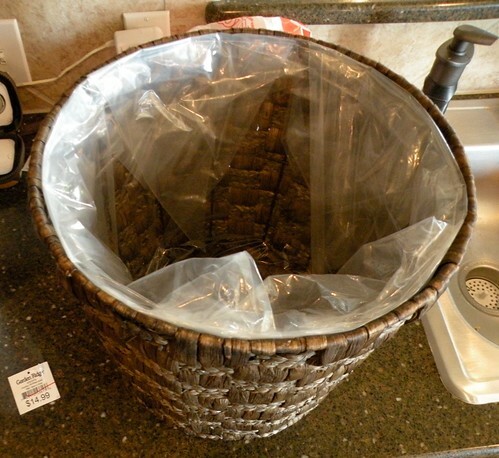 This basket was 75% off, baby! Only problem is, it’s for a plant. 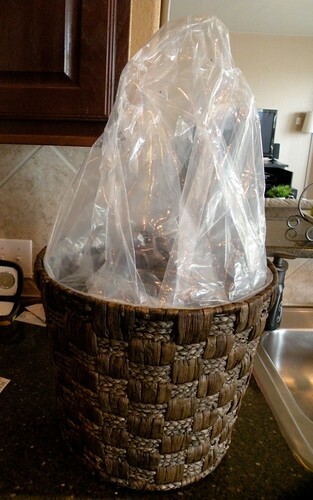 I don’t want a basket for a tree. 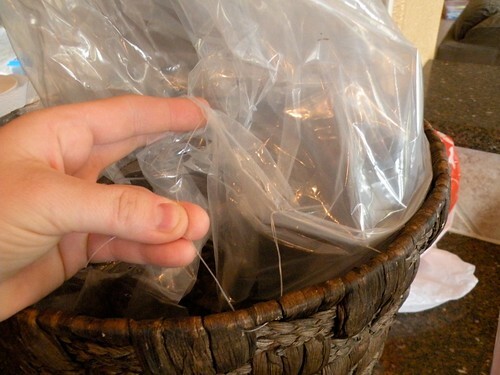 I want a basket for my home for toys and junk and magazines. But all those weren’t 75% off. So I had a brazilliant idea. Buy this one for less than four bucks and just cut the plastic out. It was waaaay easier than I assumed it would be. I just pulled up all the plastic first. And then discovered that it was just lightly stitched into the wicker. Niiiice. I just snipped the thread, and out it came. You can’t even tell that it use to have a liner in it. And another awesome thing – the plastic is a huge square piece that will be great for doing messy crafts on. Now I just need to figure out where to put it. Maybe here by the fireplace. Maybe next to the entertainment center. Not sure yet. Great Find Allison, that is the best isn’t it? Great find. 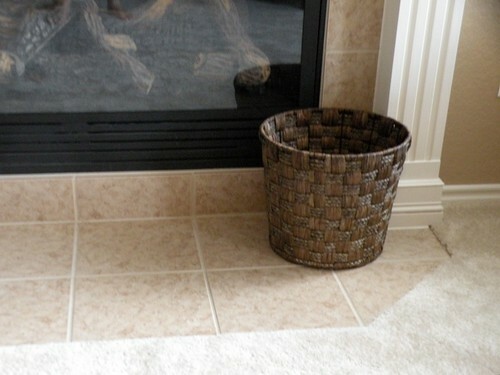 I like the weave of that basket too. It’s a nice pattern. I’m sure it will be filled up before no time. Guess you are neve too old to learn. I have never even heard of Garden Ridge! This is the stuff you need to tell me about lady! Oh my goodness, what a wonderful idea. I am totally stealing this from you! i swear…i need to move! we don’t even have a hobby lobby here in southern arizona. the closest one is 2 hours away. and my town is not small. with all the outlying areas we are over 1 million. and all we’ve got is michaels…boo, boo. and now you tell me there’s more awesomeness at some place called garden ridge. that’s it. i’m heading south. oh, wait…my husband says he can’t come. the things we do for love. Beautiful basket! That would be great for so many things!! Have fun stuffing it!! I am sure it won’t take long before you have stuff to fill your basket with. Great find! I love baskets! I recycle them and use ’em EVERYWHERE… I get (or paint) them in bright colors for my daughters’ bathroom and store their clean towels/washcloths, bathing suits, nail polish, extra soaps and toiletries… in the living room I use different shapes and sizes to store our wii games, wii mats, dvds, blankets, yarns, books, pet toys, playing cards, and corral flip flops by the door… in the kitchen I use smaller ones to group spice packets, snacks and small lunch containers for school. 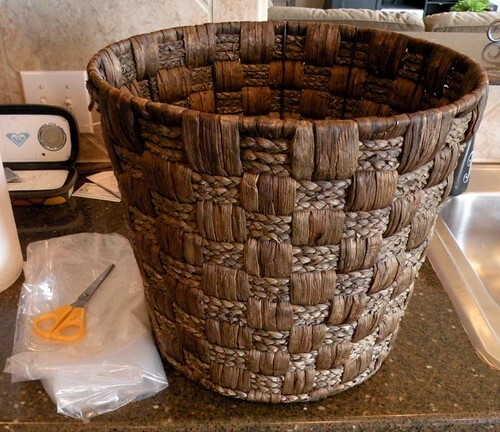 Even the office has baskets; great to store desk-top accessories, etc. Soooo many uses. My only rules – don’t go cheap looking and they can’t have a country look (my house is more contemporary/Mediterranean. I just did this on a basket I found at Goodwill! It fits all our Wii accessories inside the TV stand and looks so purty through the glass! brazilliant, LOL! Great idea; I love getting things for a huge bargain! Awesome! 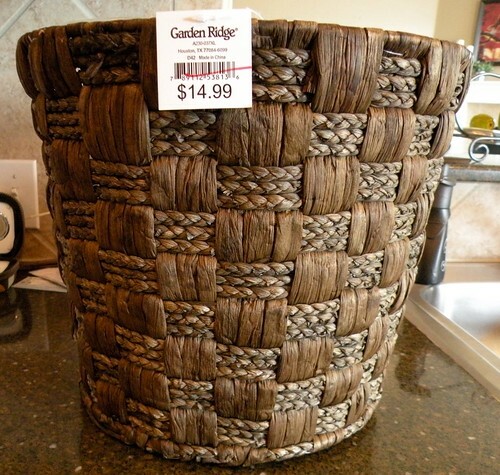 Oh, I love those expensive baskets at Target but can’t bring myself to buy any…you found a steal. I would add a small rectangle, chalk board, piece on the front. Have you seen those? Love em!